Welcome to Local 262 Take the first step toward a better tomorrow! Local 262 (KENILWORTH, NJ) represents workers from a wide variety of occupations that range from food processing to retail manufacturing to service and health care. Members from Local 262 may work in different industries and speak different languages, but they have one thing in common - Local 262. We are the voice of the individual. Local 262 has successfully fought for workers’ rights through grievance Arbitration and unfair labor practice charges. As you have seen in history, the single voice goes unheard, but the voice of many benefits all. Remember: united we bargain, divided we beg! At Local 262, we are dedicated to obtaining the best working conditions, benefits and wages we can negotiate together. Join us and "Take the first step toward a better tomorrow." Check out all the details about our upcoming meetings. 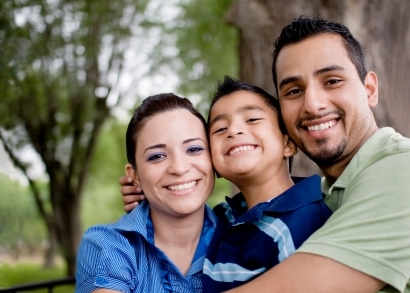 Learn about the benefits available to you by the Fund. Tuesday, February 5, 2019 Excerpt from www.politico.com article. Tuesday, September 11, 2018 Excerpt from www.njbiz.com article. New Jersey residents seeking health care in 2019 will see their rates drop by an average of 9.3 percent due to a package of laws and executive actions signed by Gov. Phil Murphy since assuming office in January, the governor said Friday. Speaking at the Riverview Medical Center in Red Bank, Murphy said the decrease came despite efforts by President Donald Trump and the Republican-controlled Congress to undermine the Affordable Care Act. ATTENTION MEMBERS YOU SHOULD HAVE RECEIVED THIS LETTER IN THE MAIL IT IS YOUR TEMPORARY PRESCRIPTION CARD. If you did not receive this letter, please call the Union. Tuesday, November 7, 2017 Excerpt from www.northjersey.com article. Philip D. Murphy, who grew up "middle class on a good day" in the Boston suburbs but found fortune on Wall Street before turning to politics, defeated Lt. Gov. Kim Guadagno on Tuesday night to succeed Chris Christie as the next governor of New Jersey. "Tonight we declare the days of division are over. We will move forward together. This is exactly who we are in New Jersey. We have each other's backs. To believe in each of us is to believe in all of us," Murphy said after jumping his way onto the stage to address supporters in Asbury Park's Convention Center. Phil Murphy knows the issues that working families go through because he has gone through them himself. Phil says, he “grew up in a family that was middle class on a good day.” They lived paycheck to paycheck. His mom was a secretary, his dad never graduated high school and took any job he thought could help him support his family. He put himself through college on loans and part time jobs. Phil Murphy has worked his life to give back as an adult. He’s helped local charities to support troubled teens and domestic abuse survivors, and these groups have changed thousands of lives for the better, Nationally, Phil serves proudly on the board of the NAACP, the world’s oldest civil rights organization. In 2009, Phil answered President Barak Obama’s call to service and became U.S. Ambassador to Germany after his confirmation by the U.S. Senate. 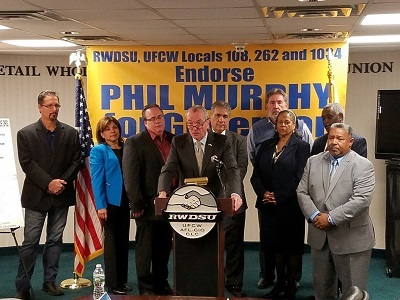 Phil Murphy is the best candidate for working families and RWDSU members. Phil Murphy will fight to bring New Jersey an economy that works for everyone. Primary Election Day is June 6th and I hope that you will join me in voting Phil Murphy for Governor. Left to right Dan Righetti Sec-treasurer Local 262 Pat Gonzales Sec-treasurer Local 108 Tom Walsh Pres Local 262 Phil Murphy candidate for Governor Joe DiCarmillo Pres Local 1034 back Gary Barker Sec-treasurer Local 1034 Cassandra Berrocole Pres Local 3 Joseph Dorismond Recorder RWDSU/UFCW front Pres Charles Hall Jr. Pres Local 108 at an event announcing endorsement on Nov. 27. RWDSU Locals 108, 1034, and 262, all based in New Jersey, have endorsed former U.S. Ambassador to Germany Phil Murphy for New Jersey Governor. Murphy has a strong record of publicly-stated views and policy that would help working people, including supporting a raise of the minimum wage to $15 an hour and fully funding public pensions. “Mr. Murphy has put forth great ideas and vision on or to grow our state and economy, and he knows the importance of good jobs and benefits. He knows that unions are good for our state, country, and the world,” said Local 108 President Charles N. Hall, Jr., Local 262 President Tom Walsh, and Local 1034 President Joe DiCamillio in a joint statement. “Now more than ever, we need a governor who understands the importance of a government that works for all of the people,” they added.